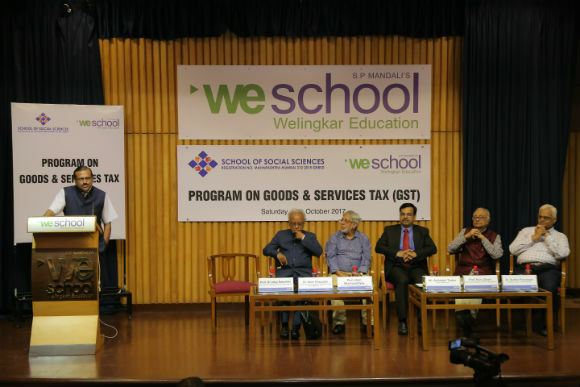 Mumbai: ‘Good and Services Tax (GST) – Critique, Legislation and Implementation’, a seminar was organised by School of Social Sciences and S. P. Mandali’s Prin. L. N. Welingkar Institute of Management Development & Research (WeSchool). The objective of the event was to deliberate and discuss ‘Good and Services Tax (GST) – the concept, structure, challenges and its full potential to benefit common man at large. The event witnessed noted gurus from academia and finance sector, such as Shri Ashutosh Thaker, CA, NMAH & Co; Prof. Jiban K Mukhopadhyay, Former Chief Economic Advisor, TATA Group and Prof. Kanu Doshi, Dean Finance, WeSchool, as speakers. The event opened with Dr. Sudhir Paranjape, Director, School of Social Sciences, setting the context of GST and how the reform has proceeded till now. Hon’ble Dr Asim Dasgupta, presented the journey of GST from its inception to implementation. “GST is a powerful mechanism and its true effectiveness can be realized when both the State and Central Government work together. Introduction of VAT was the beginning, it had the potential to reduce tax burden and increase revenue and GST is the nest step in this direction to set the nation on an accelerated path of progress”. “The structure of GST was created in consultation with States, trade bodies, chambers of commerce etc hence the structure that emerged out of this effort is good but its implementation needs better and smoother processes for the benefit so all stakeholders. Removing the bottlenecks in the processes will not only benefit industry and trade but encourage entrepreneurs immensely. Evasion of tax and hiding black money will become impossible bringing in long term benefits to Indian economy ”,he added . The seminar continued with the experts expressing deep concerns about the roadblocks faced by the stakeholders in the implementation of the GST. Shri Ashutosh Thaker, Chartered Accountant and renowned specialist on GST, elaborated upon the ground realities and roadblocks faced by almost all sectors focusing on textiles, jewellery, bullion, exports, SMEs, and outlined possible solutions. “Providing a system of service providers was a very thoughtful step meant to help the business community in filing their returns but the care should have been taken to establish smooth functioning between their computer systems and network and that of the GST”, he said. Prof. Kanu Doshi, Dean Finance, WeSchool, too emphasized on the acute need for streamlining the procedures implementation of GST and added that slowdown in economy should not be linked to GST. The seminar ended on an optimistic note that by 2019, all the teething troubles in the implementation will be removed and GST will really become the biggest instrument of economic and social change in India. While Prof Jiban K Mukhopadhyay anchored and summarized the proceedings, Prof Madhu Paranjape proposed a vote of thanks. Seminar was excellent. All the facts stated were the ground reality.